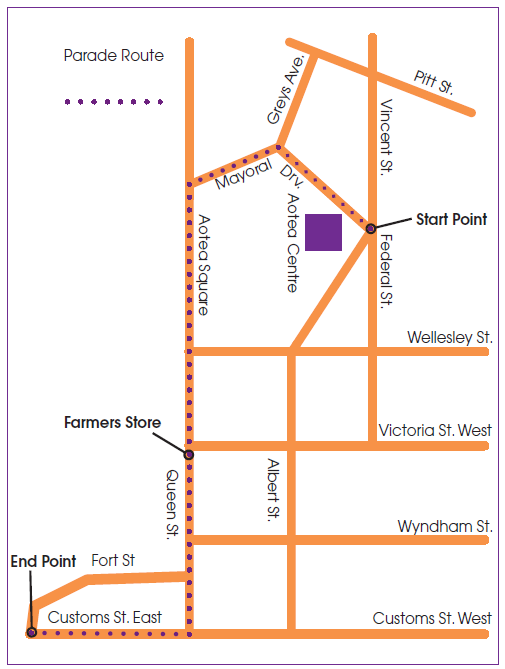 Parade Planning | Auckland Farmers Santa Parade! The Farmers Santa Parade is now on Sunday 2nd December at 1pm in Auckland CBD. Your favourite characters will still be joining us, as well as Santa so don’t miss out and we’ll see you next week! This page is dedicated to giving you all the essential logistical information you will need for parade day! The Parade starts at 1pm and ends at approximately 2.30pm, with Santa’s Party from 2.30pm to 5.00pm in Aotea Square. The Parade Route is long and takes approximately 1 hour to pass any given point. Top Tip: The best (unknown) viewing spots are Mayoral Drive and the corner of Upper Queen Street and Mayoral Drive. There is usually ample space to even lay down a picnic blanket and then wander down to Aotea Square afterward! Please note exit before 2pm and after 6pm will incur a fee. For information on Bus, Train and Ferry schedules and fares including family and group passes visit at.govt.nz/bus-train-ferry or call the AT Public Transport Contact Centre on 09 366 6400. It rained on our Parade! Due to bad weather, we’re postponing the Farmers Santa Parade to the new date of Sunday 2nd December at 1pm in Auckland CBD. Your favourite characters will still be joining us, as well as Santa so don’t miss out and we’ll see you next week! This line will be painted along the Parade route. The Police ask that all Parade spectators stay behind the line while watching the Parade! Let the Christmas celebrations go on after the Parade with Heart of the City’s guide packed with fun events, unique gifts, delicious dining and so much more. Click here for more information!